"It's not the big that eat the small. Today, it's the fast that eat the slow. Zebras and Cheetahs teaches you step by step how to run faster, to be agile in the business jungle, and to pounce on opportunity 10x quicker than your competitors." "Business is a game for everyone, and whether you're an entrepreneur, a small business owner, or a corporate executive, you need a guide. If you're striving for growth and profound leadership, the Zebra and Cheetah philosophy will not only guide you through the jungle alive, it will position you to be King." "A fresh and unique look at leadersand how to become a better one." "Standing out by being decidedly different, agile, and resilient are three themes of utmost importance for business success today. This book will give you insights, strategies, and tactics for achieving all threeand much more." "Growing a business is not easy or for the faint of heart. 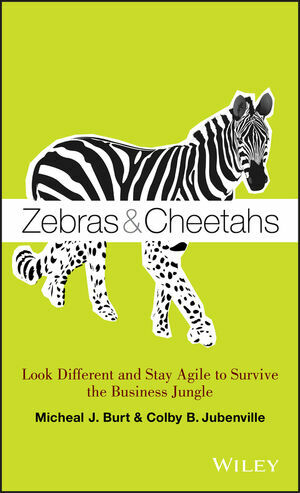 In Zebras and Cheetahs, Micheal and Colby offer a refreshing and entertaining take on how to see what you do differently, grow your leadership capabilities in new ways, and execute a growth plan." MICHEAL J. BURT represents the new age leader: the Zebra and the Cheetah. Part coach, part entrepreneur, and all leader, Coach Burt is the go-to guy for entrepreneurs who want to become people of interest, salespeople who want to be superstars, and managers who want to be coaches. He is a former championship coach and the author of eight books. His radio show, Change Your Life Radio, can be heard globally on iheart.com (WLAC). Follow Coach Burt at www.coachburt.com. COLBY B. JUBENVILLE, PhD, holds an academic appointment at Middle Tennessee State University (MTSU), has published over thirty academic and trade journal articles, and is principal and founder of Red Herring Innovation and Design (www.redherringinc.com), an agency specializing in teaching people and organizations how to compete on unique perspective, education, and experience in order to create unique value. He regularly speaks on his philosophy, Collective Passion, that teaches others how to meaningfully connect organizations, customers, and employees.